Use it for installing sockets/power outlets and switches on external thermal insulation facades of buildings. 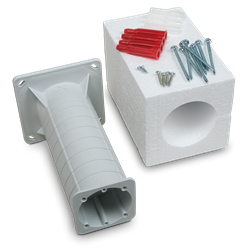 Eliminates the creation of thermal bridging. Used through insulation panels with thickness from 50-200mm. Makes future access to electrical components (installed through thermal insulation systems) an easy task and simplifies the process of their maintenance.